Hand drawn Solid colour dinner candles. In range of colours as shown. 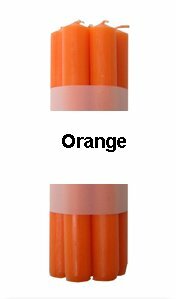 These candles are solid colour all the way through to core and are very high quality. single candle size approx 8" tall x approx 22 mm diameter base, approx burn time 8 hours + . Sold in boxes of 12 of any one colour, click more images to see samples of colours. Non drip, Non smoke, 8 Hour burn time approx. Only colours shown in the more images are available (not chart matched).